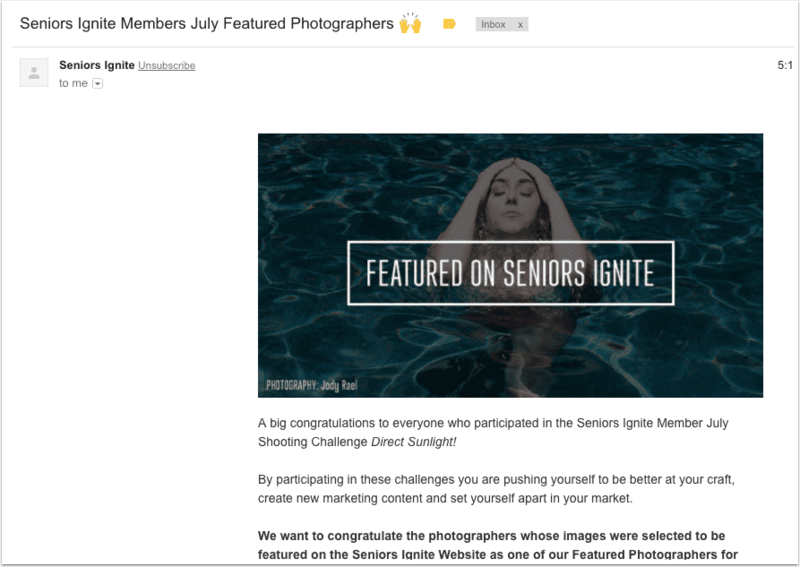 Are the emails that are sent from your WordPress site getting marked as spam or not delivered at all? Here’s how an SMTP email service and Custom Domain Authentication can help eliminate that. An SMTP (Simple Mail Transfer Protocol) provider is service used for sending email, and is much more reliable than relying on WordPress. WordPress uses a built-in function called PHP mail() to send emails coming from your site. This is used for things like sending emails generated by contact forms, lost passwords or WooCommerce transaction emails. There are several problems for relying on the WordPress built-in mail feature to send emails. Hosting restrictions and limits in order to control spam cause emails to be delayed or not sent at all. It’s common for security plugins to prevent the built-in mail function from working because of this as well. Unlike an SMTP service, the functionality built-in to WordPress lacks the security and authentication features that are needed for reliable email deliverability. Emails sent from a SMTP provider are less likely to get marked as spam. Especially today where it’s easy to ‘spoof’ emails and all the hacks and security breaches, Gmail, Apple, Yahoo want you to ‘verify’ you are who you say you are. When your site email isn’t working properly you’ll start having problems like contact form submissions not being sent, customers not receiving ECommerce email receipts and you won’t receive important notifications as well. A third party SMTP provider & Custom Domain Authentication eliminates those issues. 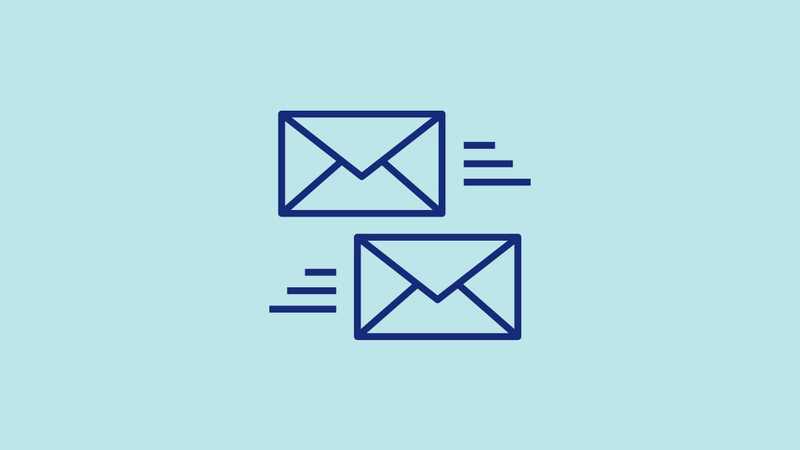 An SMTP service sends emails from your WordPress site, replacing the mail function that’s built into WordPress. 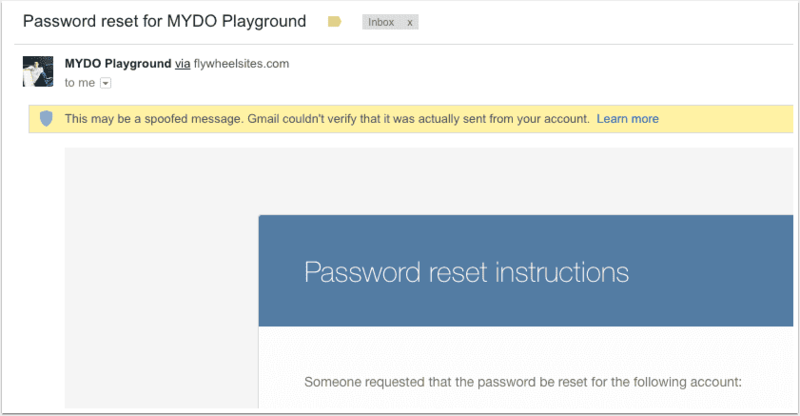 Flywheel hosting uses Sendgrid, a third party SMTP service for sending emails. 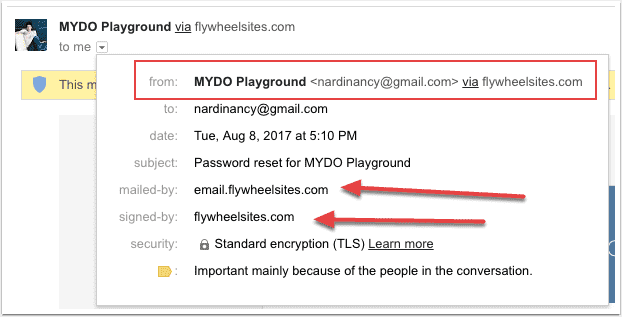 Any site with hosted with Flywheel already has an SMTP service that sends those site emails. However, if you want to send from your own verified email domain address, then you’ll have to setup your own account with a third party email service so you can setup Custom Domain Authentication. Which I recommend doing and here’s why. You can see in the image above that the email sender is Flywheel, the web host rather than my own domain. 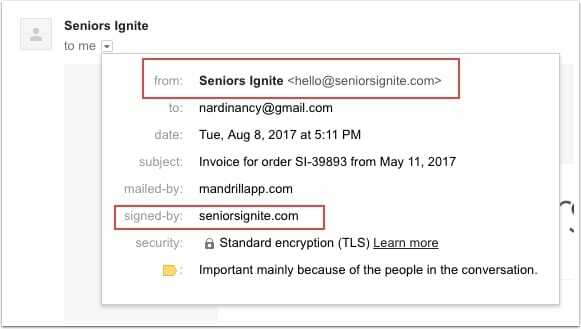 With more and more phishing and spam, many email service providers are considering blocking non-authenticated email addresses. Like the image on right. When you have your custom domain authentication it helps improve delivery rates. It removes the third party authenticated information and displays your authenticated domain information instead. The reason it’s more reliable is because ‘Authentication’ is a sender identification tool that protects email senders and their recipients from spam, forgery, and phishing. With more and more phishing and spam, many email service providers are considering blocking non-authenticated email addresses. We setup Custom Domain Authentication (custom domain keys & SPF Records) for any app we use to send emails. • Mandrill, which is a ‘Transactional Email Service (SMTP) for any emails that are sent from our website. • HelpScout - our G-Suite email accounts all go through HelpScout which is what we use to send emails for customer service. If you use a CRM like Tave that sends emails on your behalf, you should do the same thing. 1) First, in order to ‘Authenticate’ you’ll need an email from your custom domain. Email addresses from Gmail, Yahoo, Hotmail, Apple won’t work. 2) Choose an SMTP provider. We use Mandrill which is a paid service. However Mailgun is a great free alternative that will work for low volume senders. Sendgrid is another option. There are several WordPress plugins that make setup easy. I recommend one of the two below. WP Mail SMTP has nice tutorials for setup.